The Friends have been in existence since the Museum opened in 1990, providing a focus for people in Gloucestershire who take an interest and a pride in the county’s great military tradition. We arrange social events and lectures with distinguished visiting speakers and issue a regular newsletter with contributions on military history and related subjects. We also provide essential support for the Museum through our fundraising activities, which has produced over £4,000 a year, since 1990, for specific museum projects. Many of our existing members have served in or have a family connection with either the Gloucestershire Regiment or the Royal Gloucestershire Hussars. The Glosters, raised in 1694 had a particularly glorious history, earning more battle honours than any other regiment in the Army, while the Royal Gloucestershire Hussars, a Yeomanry regiment, were formed in 1795 to protect the country from an anticipated invasion by Napoleon, and – like the Glosters – are an important part of the life in the county. Their stories are told vividly and with a wealth of fascinating displays in the Museum. In recent years, successive amalgamations have changed names and badges – but the military connections with the county continue unbroken. After the Glosters were amalgamated in 1994 to form The Royal Gloucestershire, Berkshire and Wiltshire Regiment, they are now part of the Rifles who carry on wearing the Back Badge of the Glosters. Today, 1st Battalion The Rifles has its permanent home at Beachley Barracks within the county, whilst the Royal Gloucestershire Hussars soldier on as a squadron of the Royal Wessex Yeomanry. But we hope that anyone who minds about the life of the county, its history and its links with the Army will enjoy being a Friend and supporting this essential part of the county’s identity. Invitations to lectures and social events. 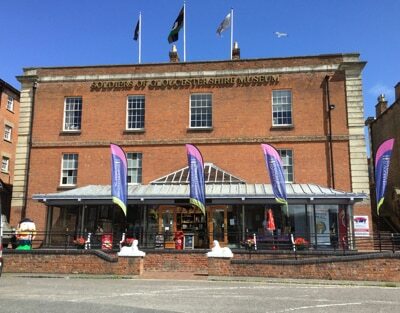 By cheque made payable to ‘The Friends of the Soldiers of Gloucestershire Museum’ forwarded to the ‘Friends’ at the Museum address ‘Custom House, 31, Commercial Road, Gloucester, GL1 2HE’. Annual rates are £20 single, £30 couples and £10 for juniors. Conversion to Life Membership is for a single payment of £200. 2005 Reception at the Museum to welcome the new Patron of the Friends – The Earl of Ulster. 2007 Reception at Cheltenham College viewing its military history held in the Library and Chapel. 2008 Reception at Ozleworth Park with ‘Beating the Retreat’ by the Corps of Drums of Gloucestershire ACF. 2011 Reception on the Dockside Terrace and the Opening of the Korean Gallery and ‘Imjin 60’ events. 2013 Reception on the Dockside Terrace and a talk on ‘The History of GCHQ’. 2014 Reception on the Dockside Terrace for the Official Opening of Renewed Museum by HRH The Duke of Gloucester. 2015 Museum Reception for the Friends of the Cathedral. 2016 Reception at the MOD Medal Office, Imjin Barracks, Innsworth. 2017 Reception at Stanway House, near Cheltenham, home of the Earl of Wemyss. 2018 Reception on the Dockside with the Patron HRH The Duke of Gloucester.